The first Wednesday in August is a big day for SCARCE. 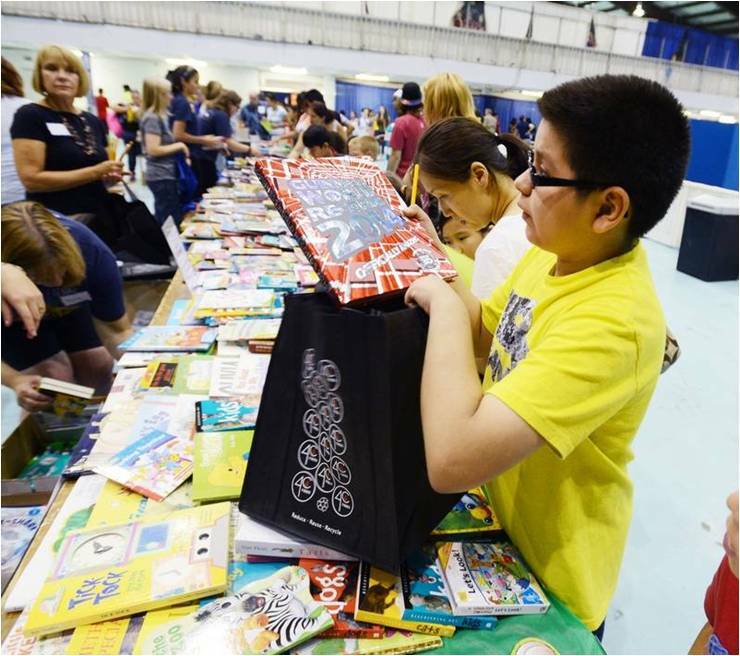 For the past 26 years, we’ve been participating in the Catholic Charities Back-to-School Fair. 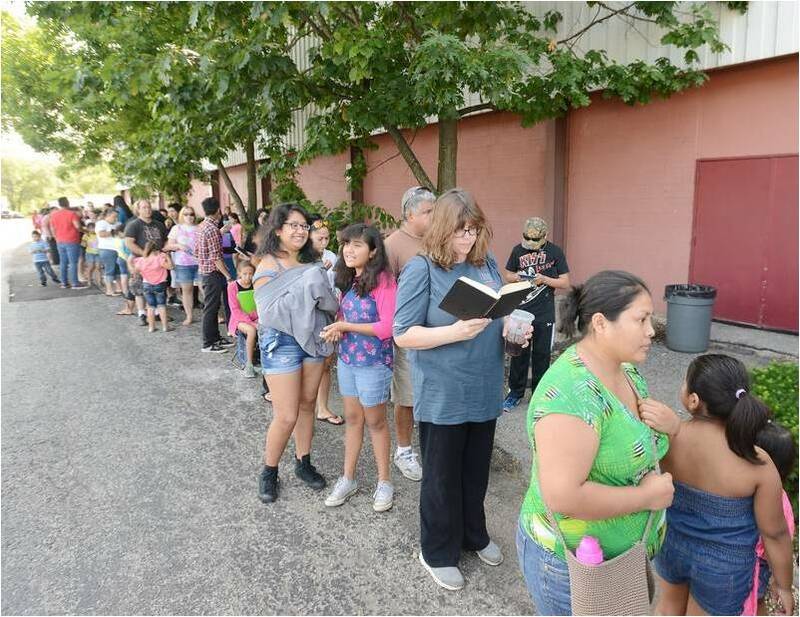 This event helps low-income families from DuPage County get ready for the school year by providing school supplies and connecting them with services, including free haircuts, dental exams and vaccinations. 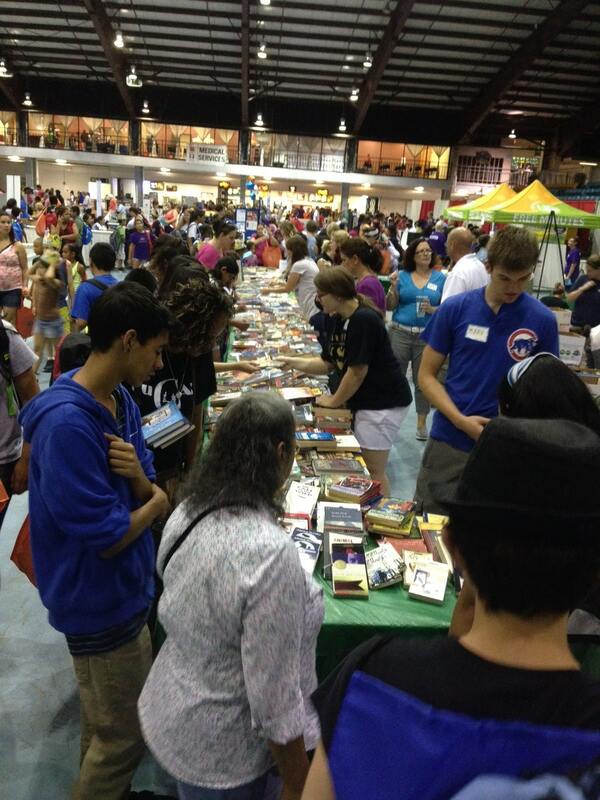 Typically, the DuPage Back-to-School fair serves around 1,600+ families. 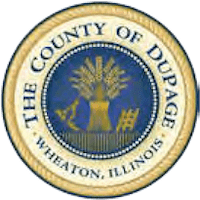 Many of us in DuPage County don’t realize that so much need exists right in our own community. Kids get to choose a few books to take home. Families wait in line for hours to get in. 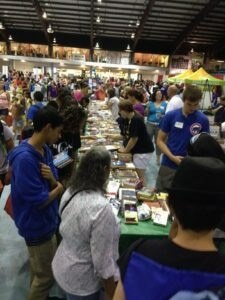 SCARCE has been attending this fair since the first year and provides free books to the children that attend. Our book rescue manager, Vicki, spends the whole year setting aside books for kids of all ages so that they have plenty of titles to choose from. She does her best to make sure she has the most current and asked-for books. Year after year, we keep track of what kids ask for that we either didn’t have enough of – or any of – in order to supply it the next go-around. We also learned that most years, there simply aren’t enough school supplies donated so families that can’t come until later in the day miss out. Vicki makes sure to set aside new and like-new school supplies and backpacks that arrive in our warehouse to supplement those donated to Catholic Charities for the event. With the help of many volunteers, we fill up 20 tables with books and help children choose a few during the fair. UPS volunteers filling their truck with boxes of books and supplies. 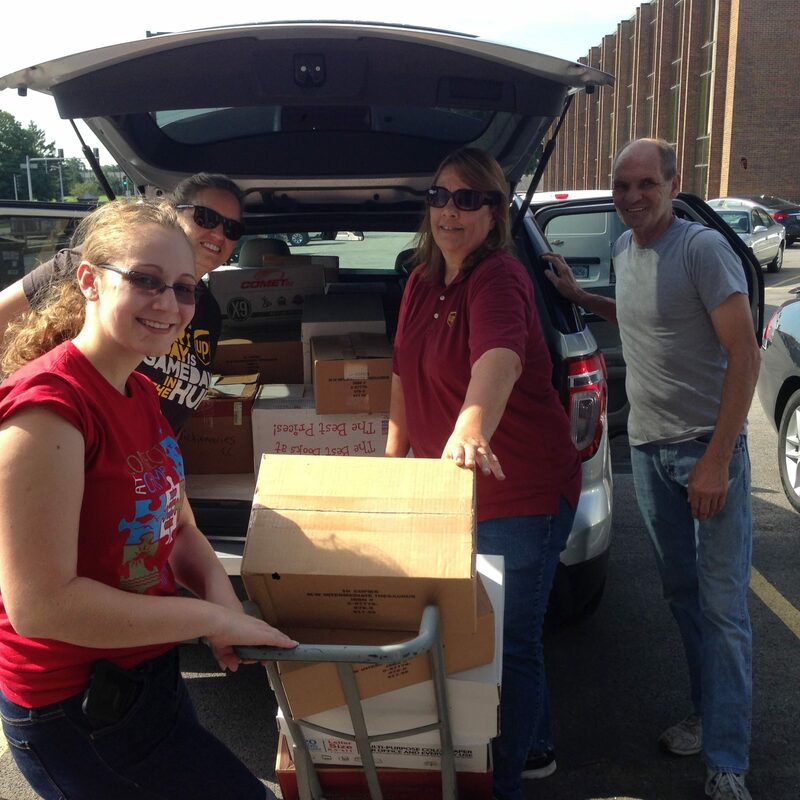 UPS volunteers filling their cars with event more boxes of books and supplies. This year’s Back-to-School year effort was a big success for SCARCE. 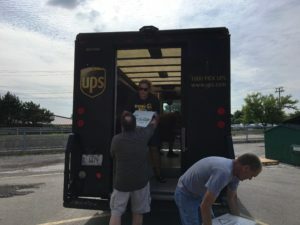 On set-up day, fourteen employees from UPS helped us deliver our boxes of books and supplies to the Odeum in Villa Park. They loaded, drove over and unloaded about 200 boxes – all in one trip (albeit many vehicles)! Five volunteers from SCARCE met us at the Odeum and helped us set-up our booth – carefully organizing and displaying books on the tables. SCARCE tables full of books and ready to go! The day of the Back-to-School Fair is a long one – the fair runs from 10am-6pm and we’ve got to take everything down at the end of the day. We couldn’t make it through that day without the help of all our volunteers! 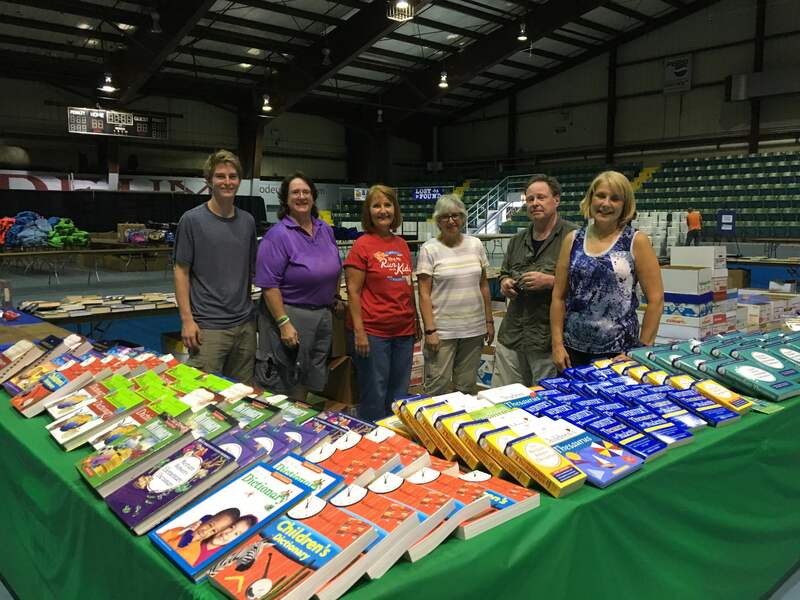 All-in-all 25 volunteers, including seven employees from Single Path in Lombard, plus a few SCARCE staff helped thousands of children choose books. We even made one more trip with the SCARCE van full of books and more supplies that same day to restock our tables. Most children were able to select at least 2 books and we didn’t return with a single one leftover. 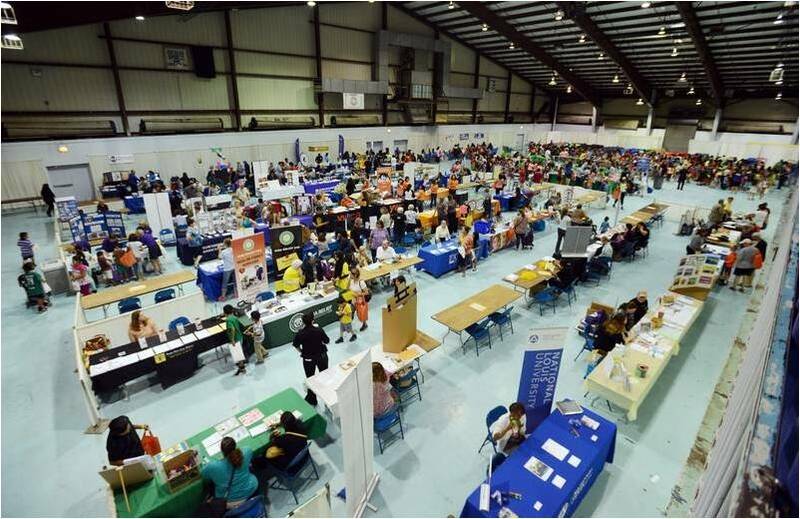 The Back-to-School fair can be an exhausting event to work – it’s a long day on your feet. Ultimately, it is a very rewarding day and we are so glad we can help so many kids and families! Not only do the supplies help parents save money for other necessary expenses but our books can help fill the “print gap” and help kids become better learners. If you are interested in helping us with the Back-to-School Fair next year, give us a call or an email. It’s a great opportunity to give back to the community in a big way.